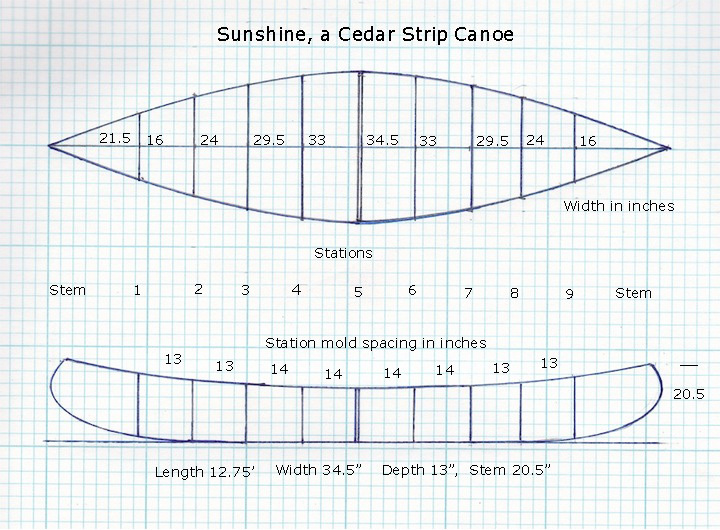 Here are drawings that represent the shape and dimensions of my canoe. They are taken from measuring the station molds and their positions on the strongback. The upper (plan) view shows the width dimensions at each station, with the stations being numbered from the bow to the stern. This view is the shape of the canoe from above. the widest part in the center being the tumblehome (see drawing below) of the hull which is a little wider than at the gunwale. In the profile view, the numbers above the sheer line show the distance between each of the station molds in inches. 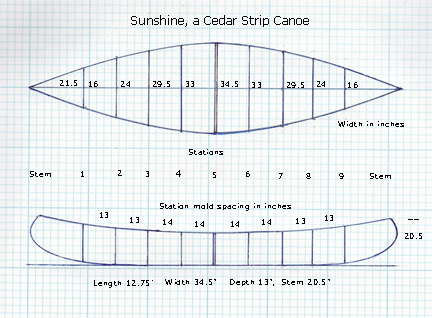 At the end the 20.5 is the height of the stems above the baseline of the canoe. This is only a sketch, not a scale drawing. 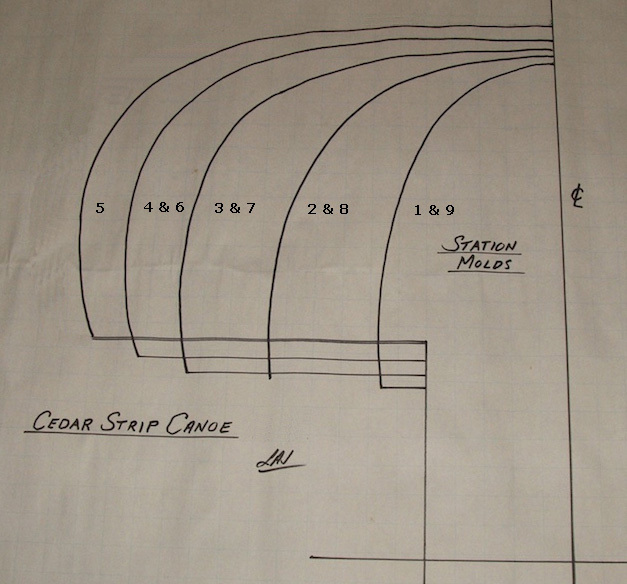 This is a photo of the drawing of station molds. It is a bit skewed due to the angle of the camera but will give the idea how they are done. The molds are half drawings done on square lined paper with 1" squares, so they are full size drawings. They can be traced onto plywood or particle board to make the station molds. The numbers are the station numbers, as I have numbered them for Sunshine, with station 1 at the bow and station 9 at the stern. Station 5, at the center, shows that the hull is wider at about where the "5" is. This is the tumblehome (where the side curves outward from the bilge area and then back in to the gunwale), a design feature characteristic included in many canoes. 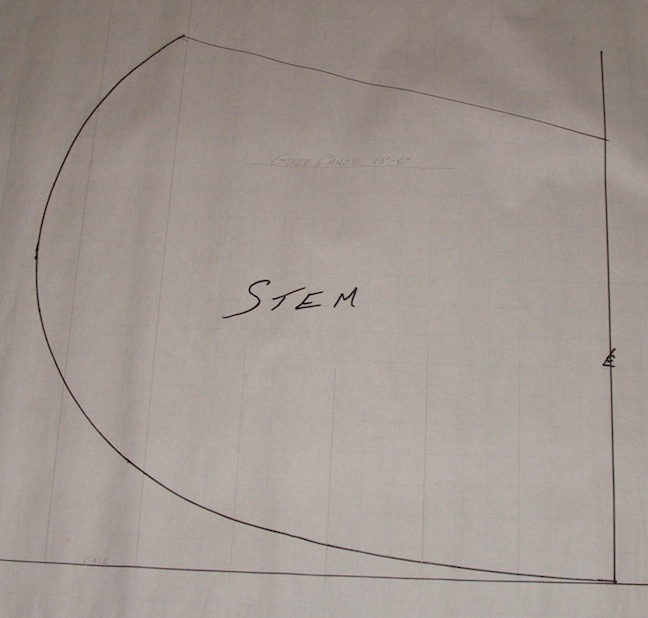 Here is the full size drawing of the stem molds. This also is drawn on 1" squares, traced onto a piece of MDF board and cut out with a band saw or a power jig saw. Two of these are made. 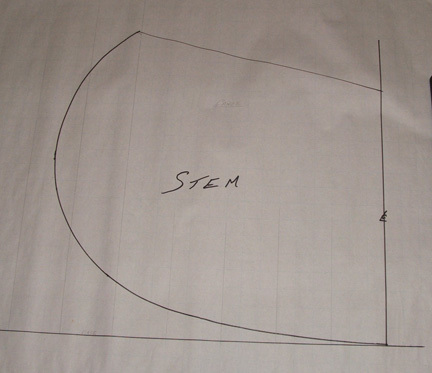 The stem defines the shape of the canoe entry and exit through the water, the height of the bow and stern stems and the amount of re-curve where the stem curves back toward the center of the canoe. See: Station Molds page for a picture of how it is mounted on the strongback. 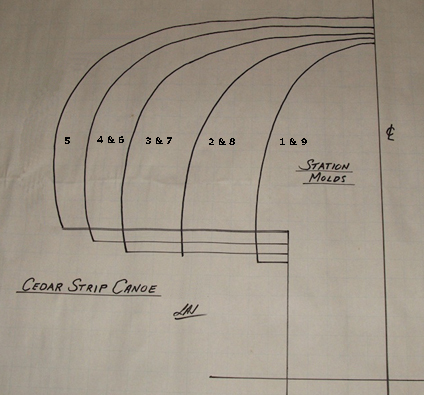 Here is a drawing of the deck plan. 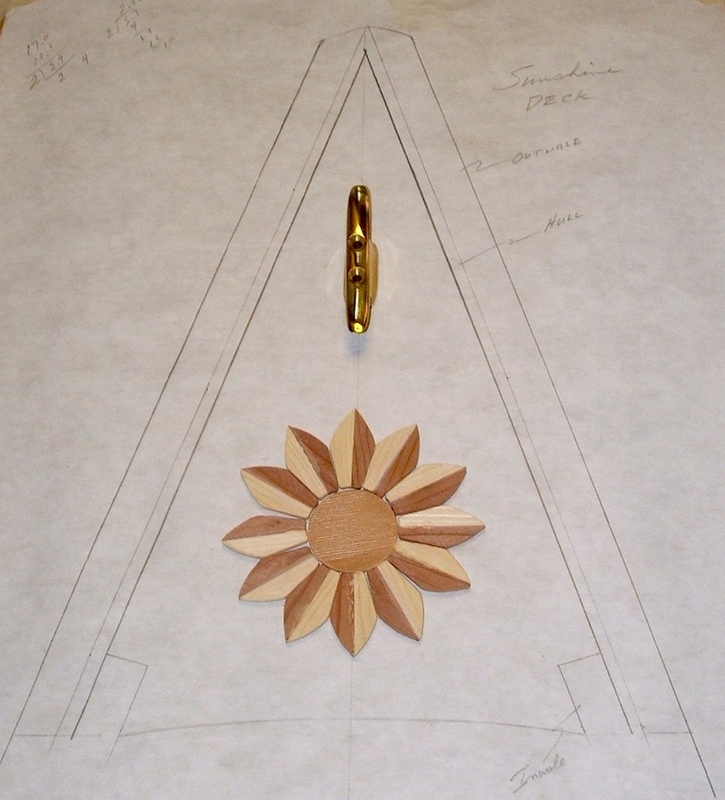 Some of the "Sunshine" wood inlay parts and the brass cleat are in place to give me an idea how its going to look. 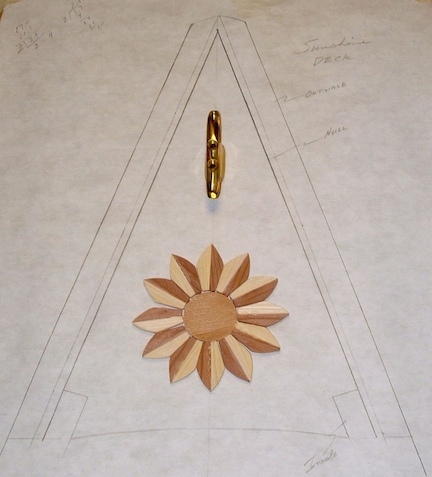 The sun inlay pieces are made using my router and the Design/Inlay kit from Milescraft. The wood is pine and redwood. It will be inlayed in the deck which is cut from western red cedar.